Buttons ⋆ 100% Private Proxies - Fast, Anonymous, Quality, Unlimited USA Private Proxy! In Google Sheets, I have a column of active hyperlinks. When you hover over one of them, a tool tip appears that contains an “open link” icon that you can click on to open a new tab that loads the url. In each cell, instead of showing the entire URL, I’d like to replace that text with a “view” button that can be clicked immediately, without having to wait for the hover-delayed tool-tip with the “open link” icon. Keep in mind, that each URL is different (in this column) and I’m looking for a solution where I can highlight all of them and convert each to a button that opens its respective url in a new browser-tab. I’m staring out in Flask, and am trying to create a local site (just to be run at home on an RPi) to show images in a directory. Before I keep going and go down some rabbit holes, I’m concerned there’s a better way to do this. I’m currently using two buttons within a form to go to the next or previous image. However, in addition to checking the if "next_photo" in request.form, I’ve seen that you could perhaps instead set a formaction on the button, and handle the next/previous photo generation that way. Thanks very much for any ideas! Here’s a .gif of the page in action. Throughout our system we are going to be standardizing when and how more information/help is used on specific input fields. I am wondering where the placement should be for radio buttons? The more information/help will be referencing the radio set as a whole. These are the potential options and I am wondering what would follow best practices for radio buttons and more information/help? I have looked around online and not found an answer since the question seems too specific! My phone is a Samsung Galaxy Note 8. I find that even a quick accidental press of volume down and power button causes a screenshot (this seems to happen a lot more often than one would expect). Is there any way to increase the time one would need to hold the buttons down in order to take the screenshot? Thanks! 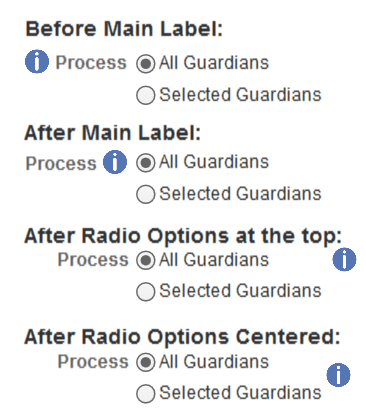 Estou querendo fazer uma forma que esses radio buttons fiquem com o mesmo name dentro de um form, mas que sejam marcados por pergunta. Pois vou enviar este formulário para um PHP e pegar lá ele como array, essas perguntas vão vir do banco de dados, portanto não coloco nomes diferentes pois pode ser que tenha 2 perguntas ou 30 perguntas, não há como eu deixar predefinido no PHP quantas questão e quais os nomes vão vir pelo POST. Alguém me ajuda, por favor?